It’s Etsy Friday again and this week I have some great finds, all in beautiful icy blue hues! Wow! 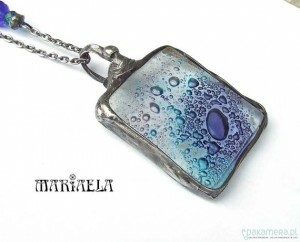 Mariaela has some beautiful jewelry in her shop. I love this pendant fused using eco-friendly tin, and created in her home studio in Poland. It is made to look like old silver. Her technique is melting glass and immersing stones, sand, pieces of metals, etc. in it. Her pieces have a modern edge, while still fitting into the current trend of “retro vintage” style jewelry. She just opened her Etsy shop in August of this year. Such a stunning winter scene. 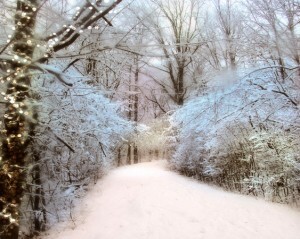 I want so badly to go down that path to see where it leads, in the hushed quite of freshly fallen snow! This 8×10 print is appropriately titled “Winter Oasis” and is offered in the donnageissler Etsy shop. It is printed on beautiful matte fine art paper and packaged in a protective sleeve with backboard. Photographer Donna lives in Michigan and says she “does her best to make pretty pictures”. I think I can safely say she has succeeded! She has won numerous awards and her work has been seen in: Decor Magazine, Black and White Magazine, and on HGTV’s Designed to Sell. Such an ice queen! I keep picturing this fascinator being used on some epic movie set. Fascinators are a form of millinery that are most typically made from feathers, and can be made from wool or lace. It is often an alternative to a hat for formal attire, and can incorporate a base making it a miniature hat. At the recent wedding of Catherine Middleton to Prince William many of the female guests wore fascinators. RubinaFascinators makes one-of-a-kind headpieces for special events like weddings, cocktail parties, etc., and is happy to take custom orders. Go ahead and place yours today! 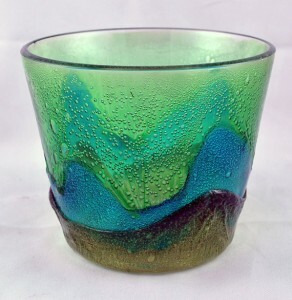 Check out this 1960’s retro blue & green ice glass/bucket. It measures 5″ by 4″, and has three distinct color layers. Super piece that would look great on the bar, or anywhere it’s displayed. Sold by Park Estate Company in San Diego, California and shipped free to the lucky purchaser. Park Estate Company has over 500 listings in their Etsy shop, so you are sure to find something to please! They say they are, “attracted to beautiful big baubles that sparkle and can only be described as fabulous”. I’ll say yes to that! This entry was posted in Etsy and tagged blue ice, Donna Geisler, Etsy, Etsy Friday, fascinator, glass, hat, ice bucket, jewelry, Mariaela, millinery, Park Estate Company, photography, Rubina Fascinators, winter. Bookmark the permalink.